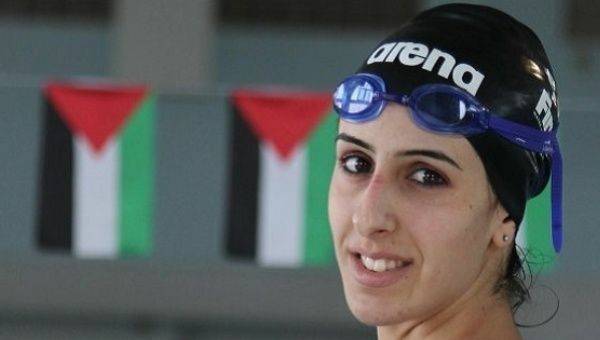 Palestinian swimmer Mary al-Atrash headed to the Rio 2016 Olympics despite the Israeli occupation making the West Bank-based athlete's training extremely difficult. The 22-year-old university graduate's preparations have been hampered because she does not have an Olympic-sized pool to train in. There are none in Beit Sahour in the West Bank where she lives — or in the Palestinian territories occupied by Israel at all. Instead, al-Atrash has had to train in a 25-meter pool — half the regulation size. She recently traveled to Algeria, where she had her first opportunity to train in an Olympic-size pool. Use of superior Israeli facilities and training partners in nearby Jerusalem, where there are several Olympic-sized pools and many swimmers, is prohibited because the Israeli occupation does not allow al-Atrash to travel to Jerusalem to train. Al-Atrash will be competing in the 50 metres freestyle competition. In total, six Palestinians are competing in Rio. The delegation will be the largest Palestine has sent to the Olympics since it first participated in Atlanta in 1996. Five athletes went to London in 2012.